Japanese Prime Minister relies heavily on his country’s potential. Else, why he would pledge to pay back the aid his country received during the ongoing crisis triggered by last month’s tsunami. “Through our own efforts and with the help of the global community, Japan will recover and come back even stronger. We will then repay you for your generous aid,” said prime minister Naoto Kan in a signed advertisement. This ad was carried in only seven selected newspapers — The Wall Street Journal, the International Herald Tribune, Britain’s Financial Times, France’s Le Figaro, China’s People’s Daily, South Korea’s Chosun Ilbo and Russia’s Kommersant. Kan’s message was translated into each country’s language. 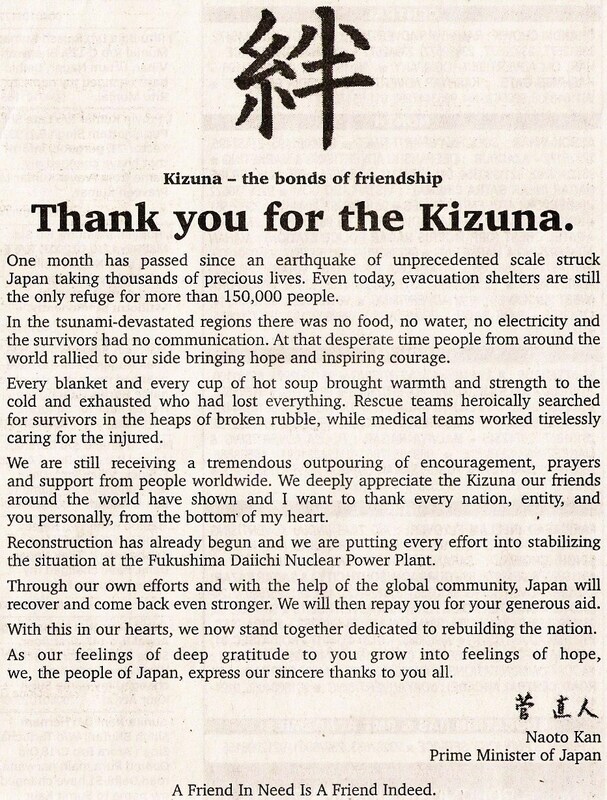 The English version of the advertisement included a large kanji character for “kizuna” and the heading “Thank you for the Kizuna,” under which Kan’s message appeared in English with his signature printed at the end. His looks were cold, he gave me gold, but not a kindly word. Then stood erect and spoke my thanks, And blessed his charity. He bound ny heard, he gave me bread, He watched me night and day. How shall I pay him back again, for all he did to me? Oh, gold is great, but greater far, Is heavenly sympathy. And amid this, my heart goes out to the families of Japan’s 28,000 people who are either dead or missing, with more than 150,000 people still homeless. Soon after the massive earthquake and tsunami, there was an international rescue effort to help the country address the crisis with around 90 countries offering assistance, including India. World’s third largest economy Japan is a regional economic powerhouse and the fifth largest donor of development aid, after the US, France, Germany and the UK. Quickly after the disaster, Asian countries that receive development assistance from Japan had expressed concern that aid budgets could be cut as the country would take time to recover. According to Organisation for Economic Co-operation and Development, India is the second largest recipient of Japanese aid, which reached $517bn in 2009. And I am also given to understand that Indian capital New Delhi’s Metro Rail’s expansion may also feel Japan’s tremors.